A must-watch video from the incredibly intelligent animal that left us in June this year. For kids who grew up in the 1980s, Koko the gorilla was a familiar face who made appearances on numerous TV shows. She challenged the way we look at animals and gave us some incredibly adorable and heartbreaking moments. Most notable of course, was the fame she achieved for becoming the first gorilla to become fluent in American Sign Language. Born in at San Francisco Zoo in 1971, she displayed the language capacity of a child with learning difficulties. Her death in June of this year saddened fans across the globe. One of the strongest messages that Koko delivered in recent years was one for the leaders of the 2015 United Nations Climate Change Conference in Paris. Released by conservationist group Noé, the video racked up nearly two million views and featured Koko pleading with humans to help the planet before it was too late. So how exactly did Koko deliver this message? 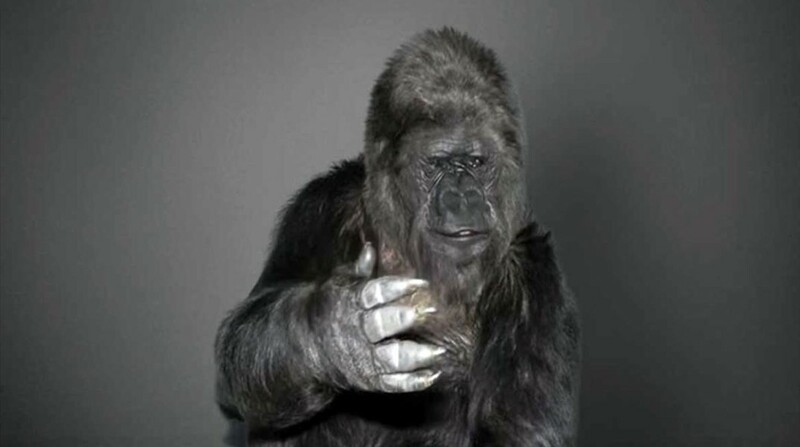 Koko was taught over 1,100 ASL signs by her instructor and caregiver Francine Patterson. She also understood more than 2,000 words in the English language and would regularly convey her thoughts and emotions into sign language. It’s important to note that at the time of the PSA’s release, a press release from The Gorilla Foundation made note that Koko was briefed on several environmental issues concerning the planet and her video message was put together in numerous takes. While the video has an incredibly high approval rating — it’s hard to hate on such an intelligent being — the message wasn’t without its critics. Snopes cited numerous problems with the PSA, calling it a “just a staged commercial” because of the lack of transparency regarding any direction Koko may have been receiving off camera. NPR also contacted a biological anthropologist who expressed doubts, saying that even the most linguistically inclined apes would not be able to comprehend the relationship between humans and nature regarding climate change. Okay, so what? None of that means that Koko’s ability to learn sign language wasn’t beyond amazing and had a radical effect on how humans view great apes and their relation to us. Perhaps even more importantly, it doesn’t take away from the importance of Koko’s message, regardless of how edited it may have been. Whether or not Koko’s command of language was truly advanced enough for her to make such complex statements doesn’t make them any less true. It’s common human nature to want to complicate things, yet sometimes even the most poignant messages are incredibly simple when you boil them down. “Help Earth. Hurry!” It’s as simple as that. Whether coming from the hands of a lovable gorilla who used to hang out with Robin Williams, or from a study regarding greenhouse gases. We need to start taking better care of our Earth if humans — and gorillas — want to be around to enjoy it.